Couples who don’t sign prenuptial agreements before they get married, still have the option of executing a postnuptial agreement at a later date. These agreements serve the same purpose as a prenuptial agreement, but as their name suggests, are entered into after a marriage has already occurred. Like prenuptial agreements, these contracts are only valid if the drafters comply with strict procedural rules. This means that many postnuptial agreements are thrown out by the courts during divorce proceedings, leaving the parties to litigate all of the issues related to property division and alimony instead. If you are already married and want to ensure that your own agreement is drawn up correctly, you should strongly consider speaking with an experienced prenuptial and postnuptial agreements attorney who is well-versed in Florida’s postnuptial legal requirements. Waive certain rights to alimony, retirement accounts, and rights upon death, if intended by the parties. Both parties must also be represented by separate counsel, which can help refute claims that an agreement was entered into under duress that are raised at a later date. 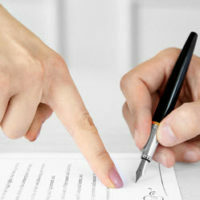 Spouses who enter into postnuptial agreements are also prohibited from including certain language in their contracts and those who do so risk having the whole agreement thrown out. For example, spouses are never permitted to waive rights to child support, visitation, or custody in postnuptial agreements. While couples can include custody arrangements, they cannot completely bar one party from seeing his or her child or even overly limit rights to visitation. The provisions contained in postnuptial agreements must also be fair to both parties, so if a court later determines that a provision is unreasonable, it can invalidate the agreement. Generally, agreements are considered unfair when one spouse excludes the other from any disbursement of wealth upon death or divorce. Finally, if it is determined that one of the parties did not sign voluntarily or acted fraudulently, the court has discretion to throw out the entire agreement. If there is an issue with only a single provision, on the other hand, judges are often willing to strike only that portion of the document and leave the rest in effect. To schedule a free case evaluation with an experienced prenuptial and postnuptial agreements lawyer about your own postmarital agreement, please call Sandra Bonfiglio, P.A. in Fort Lauderdale at 954-945-7591 or fill out one of our brief online contact forms.